STERLING NY: After nearly 40 days of Perfect Camping Nights, we finally had the chance to enjoy a couple of them. As it turns out, we were damned lucky. On Saturday August 13 at 7:17 pm the National Weather Service issued the first of several Severe Thunderstorm Warnings for Monroe, Ontario, and later Wayne Counties. This ominous line of storm cells plodded through the townships along the southern shore of Lake Ontario. We found out later that property damage along the storm path was both sporadic and alarming, with losses estimated in the tens of thousands. Despite the ferocity of the storms, no serious injuries were reported. Our campsite was on the eastern bank of Sterling Creek, in the lovely SutterCreek Campground. 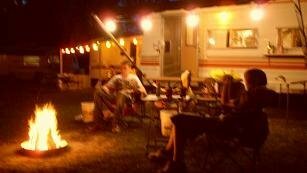 This was our first stay there, after vowing for years to camp very close to the Sterling Renaissance Faire so we could enjoy a long, tiring day at the festival. We spent most of the day Saturday enjoying great performances, delicious food, festive crowds and near-perfect weather. That idyllic weather changed fast just minutes after we returned to our campsite. "thunderstorms on the way -- 60-mile-an-hour winds and hail!" I've signed up for Weather Alerts with WROC News 8 in Rochester; they come in as text messages on my cell phone. When that first alarm for Monroe County arrived just past 7 pm, I read the note and tucked the phone away with the thought "glad we're not home, getting soaked!" As the western sky grew darker, we pulled out camp chairs, set-up the portable grill, and my wife put together a dandy campfire. My boys and I tossed the Frisbee around and kept a wary eye on the looming clouds to the northwest. We heard faint thunder in the distance. Minutes later, campground owner Dave Sutterby raced along our group of campsites, stopping at each one to warn us of "thunderstorms on the way -- 60-mile-an-hour winds and hail!" All around us our fellow campers began to batten down the hatches -- er, awnings. We four all love a good thunderstorm. Love to watch the sky change colors and light up in flashes. Then we count the seconds 'til we hear the thunder. Divide the seconds by 5 to get "miles away" (it's close enough, if not perfectly accurate). The western bank of Sterling Creek, opposite our campsite, is one big forested hillside. It was very pretty, but also hid most of the western sky and made it difficult to judge incoming storm weather. When we first saw lightning, the strikes were at least three miles distant. Man, it was one slow and scary storm! As we squared-away and generally locked-down our own site, the purplish clouds thickened and the flashes intensified. The thunder grew in depth and volume, reverberating in our bones. After one particularly vivid technicolor display, followed by a basso-profundo chorus, we decided to retreat to beneath our lowered awning. At that point, the three beautiful shade trees that canopied our site didn't look quite so sweet. Across the creek, the rising wind rustled all the forest's leaves. We kept watching and counting seconds, huddled there under our awning. I was ready to grab my family and jump into our truck for safety if things got too spooky. It never happened. The storm's center never quite made it to SutterCreek Campground, though it hovered nearby for nearly an hour. A soft rain began to fall as the twilight deepened, but it never poured. The threatened winds stayed well to the west of us, apparently. We were more than happy to report no signs of hail at all. When the storm passed (or broke up? 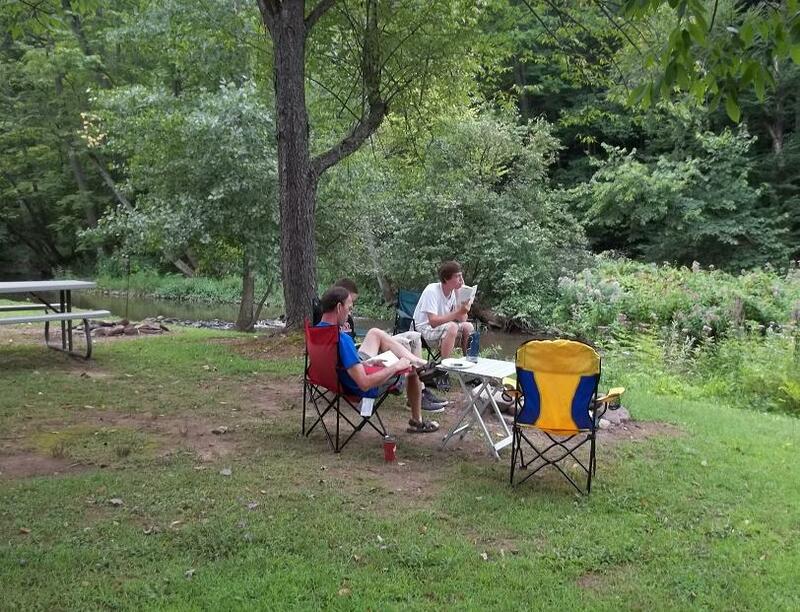 ), we raised the canvas back up, dragged the chairs back to creekside by the still-glowing fire, and enjoyed a cooler but very pleasant evening. In all the excitement I left two perfectly good hamburgers under the lid of the grill; those were the only casualties we suffered. Our drive home Sunday afternoon showed us "what might have been" if the thunderstorms had kept on coming. As we passed Ontario Center along the western edges of Wayne Country we began to see the damage -- here and there at first, and then more common as we got closer to Monroe County. Whole trees, mostly willows or spruces, had been toppled with their root-balls now displayed like satellite dishes. Other, stronger trees had suffered major damage, with giant branches snapped off like little twigs. We saw wrecked porches and sheds and side yards filled with tangled debris. Home safe on Sunday evening, we watched news reports of serious property damage elsewhere along the storms' path. One homeowner, interviewed near his devastated back yard, mentioned that he had relatives visiting who had wanted to camp behind the house. Fortunately, they stayed inside, or that interview would have been a sad one indeed. 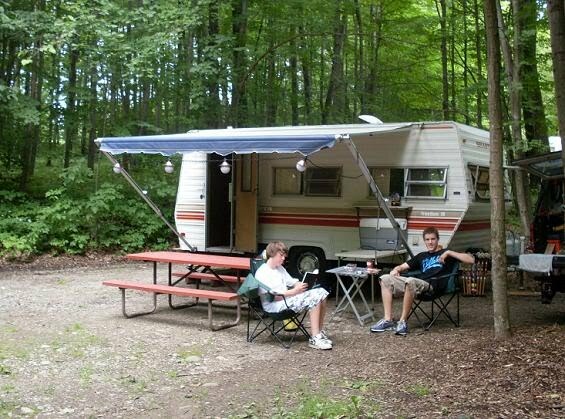 I shiver to think of how our 30-year-old tin camper would have weathered high winds, heavy rains and hail. I couldn't help but picture one or more of those towering shade trees crashing through our fragile walls and roof. We're all thankful the storm settled in off-shore, where it stayed just west of us and nearby Fair Haven State Park (with hundreds more campers, many in tents). Sometimes you simply have to count on luck and the fickle whims of Ma Nature. Have you ever been caught in a storm while camping? If you have a storm story you'd like to share, please use the Comments link below.